One of the more difficult aspects of being a bike commuter can be integrating the bicycle into your social life or more specifically your dating life. If you are a bicyclist, but your prospective partner is not, it can make for a pretty awkward first date. If you show up at your date's house on a bicycle, but she/he is expecting to be picked up in a BMW, you may not get a second date. It's probably not going to be the best match either, if you are an avid bicyclist and your partner won't even get on a bicycle. 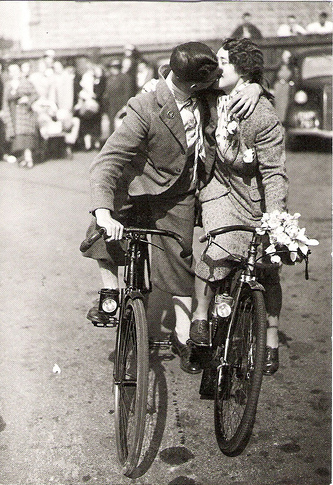 If you can at least convince them to get on a bike once, love has a chance. Car dates are so easy and boring. If your partner is adventurous and appreciates the extra planning you went through to organize a fun bike-date, he/she is a keeper. If you're looking to incorporate bicycling into a few dates, here are some local bicycle date options. This event tops the list by a mile. What could be better than forming a team of two with your sweetie and riding around town, looking for clues, mystery in the air, being silly, and enjoying a drink after? Nothing. From Main St in Pueblo all the way to the Pueblo Reservoir, the Arkansas River trail is a wonderfully scenic and peaceful way to spend the day with your better half. Plenty of secluded, romantic places along the trail to stop and stick your feet in the river, or take an adventurous late night skinny dip. If you're hungry or thirsty, stop at the Nature Center for some food and drink. The margaritas cost a bit, but they are worth it! In the 1950's the buzz was drive-in movies, get with the times, bike-in-movies are what it's all about. Pack yourself a small picnic, a bottle of wine, some brewskies, and a blanket and ride down on the river trail to enjoy film under the stars and along the river. The romantic meter equals 10. Take a lovely evening bicycle cruise down to the Union District, park, and walk around looking at some great Pueblo art. It's becoming the most vibrant event that Pueblo has to offer, and it's only going to get better. Pack along some deodorant (I don't prescribe to this, but luckily I have a girl that enjoys the natural aromas) because things may get intimate after some art, wine, and a stroll around the Riverwalk. If you don't have a mountain bike, don't worry, sign up for a co-op membership at CSU-P Outdoor Pursuits and borrow one for the weekend. Tons of different trails for a wide variety of skill levels. Ride out to Pedro Point and enjoy the incredible view or sneak down the cliffs to the lake and take an eye-opening swim. A great activity for people that like hunting for treasure or just like looking through other people's junk. Make yourself a list of yard sales in your area, draw up a good route between them, and start riding. After a cup of Saturday morning coffee, this is a fantastic way to leisurely start your weekend. The environmentalists in Pueblo realize that we are in a desert and over-watering your long is ridiculous. There are tons of great xeric gardens in Pueblo and it's really fun to ride around by bicycle to look at them. There is a Pueblo xeric garden tour/brochure available at Campbells Nursery that gives specifics on how to find the premiere gardens in town. Ride, and smell the flowers, not the car exhaust. They say the direct way to your lover's heart is through their sweet tooth. A morning coffee and bakery tour by bicycle is a great way to kickoff a Saturday. Start with some coffee at the Tea Tree Cafe, ride down the hill to Hopscotch Bakery, then take a mellow cruise out into the county and visit the Mauro Farms bakery. This way, there's no need tot worry about how many carbs you take in, because you'll be burning them right off. Sounds like some great ideas for fun things to do on a bike. A couple years ago, I was travelling on the west coast with my Montague folding bike and did a bakery tour. It was so fun and I biked off all those calories.